A hand coloured copper plate engraving published by Robert Wilkinson in London circa 1770. This evocative image is as interesting for its maritime detail as it is for its topography. In the background we see all the main buildings of the city dominated by the magnificent Church of Saint Lawrence. Beautiful tree lined gardens border the River Meuse in front of the cathedral whilst to the left and right are customs houses and quays. 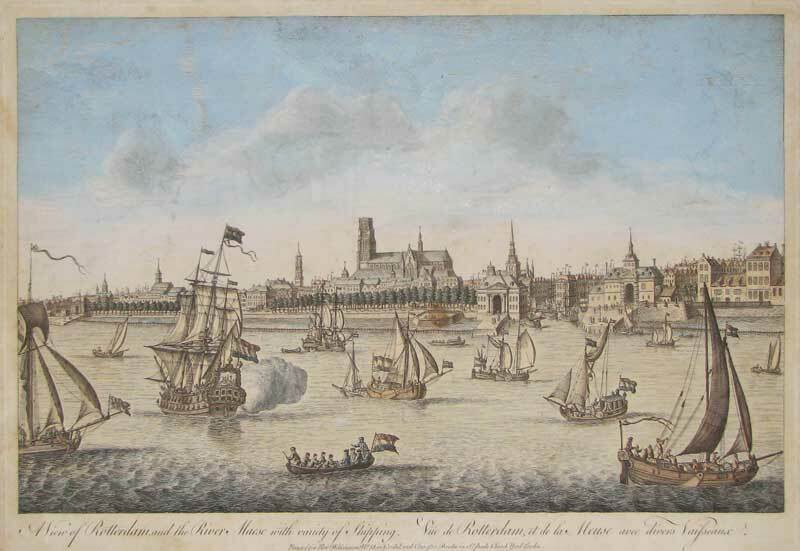 In the foreground the river is full of all manner of vessels including several Dutch Men 'o War. At a time when relations between the English and the Dutch were still volatile it would have been fascinating for a London audience to see images of the enemy's port. The Anglo-Dutch wars were fought at sea from the middle of the C17th right up until the 1780s. Even as late as The Battle of Camperdown in 1797 the two nations were still fighting on the high seas. Topographical views of European cities were vital to the understanding of geography in Georgian England. They provided an essential way of understanding what lay beyond our shores and were avidly collected by those embarking on Continental trips as souvenirs of their travels.